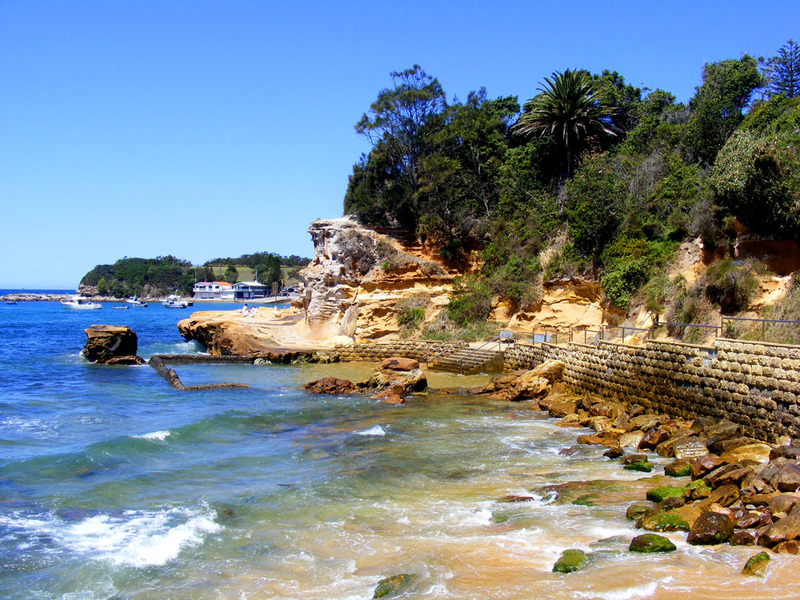 While we were staying on the Central New South Wales Coast we had lunch one day at Terrigal with Simon's Dad. 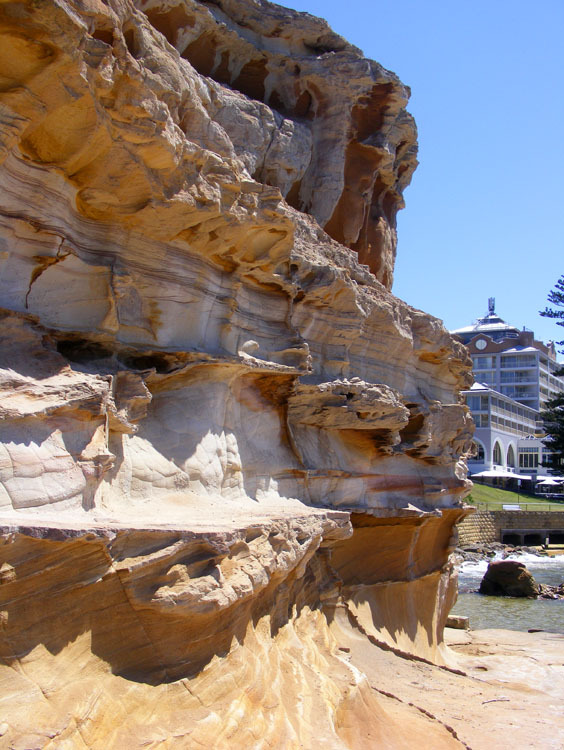 The cliffs at Terrigal reveal the most dramatic rock formations, laid down in the Triassic and now weathering away. The Terrigal sandstone is a lithic sandstone, which means it has up to 75% quartz particles mixed with clay, silt and iron. It weathers very quickly and easily. 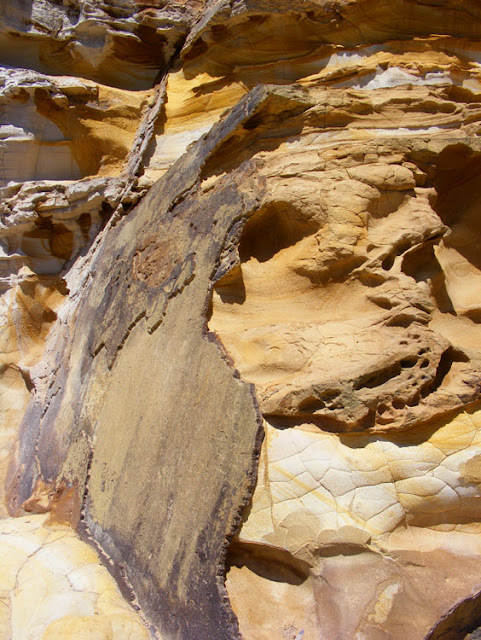 The full depth of the formation is about 200 metres, but only the topmost layers are exposed at Broken Head where these photos were taken. The area had been a shallow inlet surrounded by a tidal swamp. As the sea levels rose the sandy shale was deposited along with some fossils and leaving ripple marks in the rocks by the tidal pool. Nowadays, some sections are weathering in a honeycomb pattern. The rocks are a mixture of kaolinitic sandstone with layers of goethite hydrous ferric oxide. 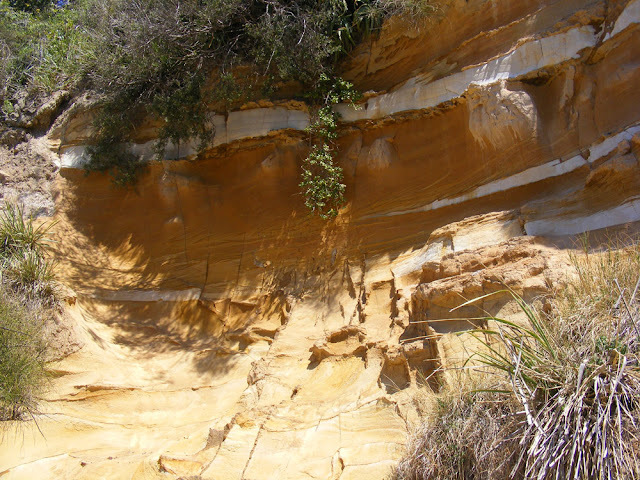 The white parts are kaolinitic sandstone, rich in aluminium compounds. The reds and purples are iron oxides of different sorts. There are also clay rich shales, silica rich siltstones and conglomerates known as pudding stones (a mixture of clay and small rounded boulders). If, as you said, the rock formations are dramatic, the photos are stunning! We love rock formations like this and always wonder how the layers came to be and so distinct.